Buona Festa di San Antonio a tutti! 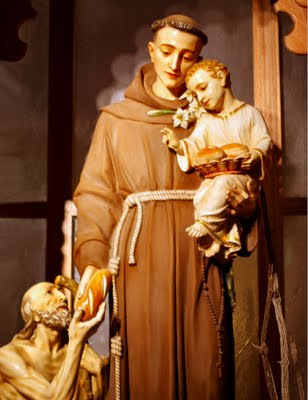 Today is the feast of the great Saint Anthony of Padua! Traditionally on this day, Italian Catholics would start the day with Mass, followed by the Priest blessing animals, lilies, and bread in honor of the charitable San Antonio! Except this one is kind of cheating!! I use my bread machine to do most of the work, and then I take all the credit. The machine mixes, kneads, and rises the dough. Then, when that's all done, I simply roll it out and bake it! Perfect for a pregnant mammarella who won't be caught barefoot in the kitchen for TOO long! Add the oil, water, honey, and egg into your bread machine container. Mix the dry ingredients (except for the yeast). Add the dry ingredients on top of the liquid, maintaining the separation of the liquid & dry layers. Make a well in the center of the flour mixture. Add the yeast. Turn on the bread machine (set on a 2lb dough cycle) and wait patiently!!!! When the dough is done, remove it from the bread machine. This dough will be wet and sticky. Use enough all purpose unbleached flour to coat it and make it workable. This recipe makes a soft, fluffy dinner roll. If you want a crisper bottom, try baking it on a pizza stone with a water bath in the oven, but it really is not meant to be a crusty loaf, yet it still tastes AWESOME and is versatile enough for almost any meal! I was able to go to Padua last year and see the Basilica of St Anthony. It was an amazing experience and I am not even religious! Padua was a charming little town with some enlightening sights. Padua IS a darling town! I got to go there YEARS ago....10 years to be exact! I miss Italy! Oh how I envy you, Wanderfull Traveler!